Marco Stiepermann doubled Norwich’s lead in the 12th minute against Queen’s Park Rangers. 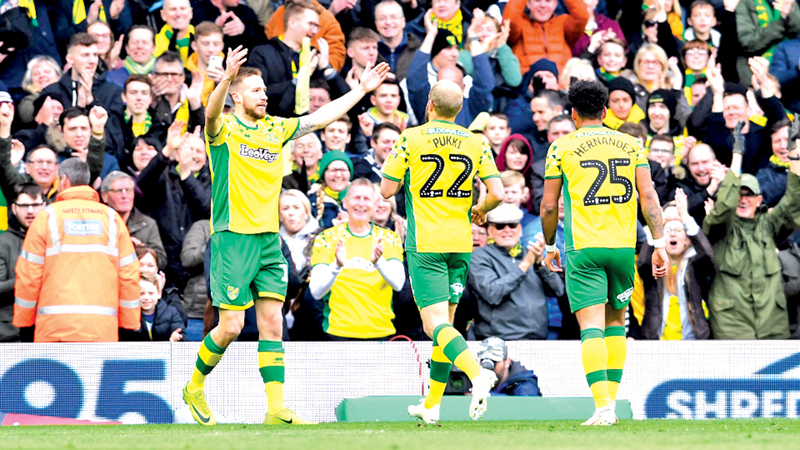 LONDRES, Saturday - Championship leaders Norwich are closing in on promotion to the Premier League after thrashing QPR 4-0, while Leeds crashed to a damaging 1-0 loss at Birmingham on Saturday. 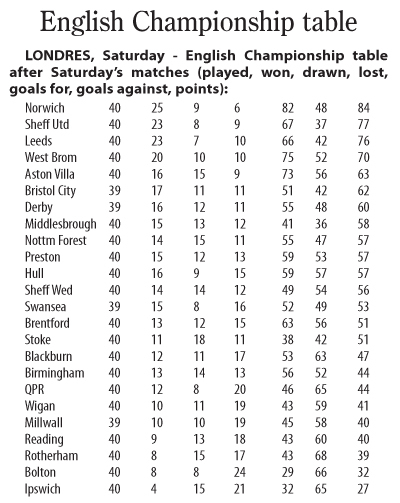 Teemu Pukki’s brace plus goals by Emiliano Buendia and Marco Stiepermann sent Norwich seven points clear at the top. The Canaries, who have now won eight successive league games, look odds-on to return to the top-flight after Leeds slumped to third place. Birmingham’s top scorer Che Adams had gone six games without a goal, but he ended that run on the half-hour mark to give the hosts, who had lost five in a row, a first win since their nine-point deduction. Sheffield United leapfrogged Leeds back into the top two with a 1-0 win over Preston. David McGoldrick scored the only goal in the 31st minute at Deepdale to put the Blades one point clear of Leeds. Fourth-placed West Bromwich Albion’s automatic promotion hopes were dealt a blow with a 2-0 defeat at struggling Millwall. The Baggies had won three in a row but were behind when Ryan Tunnicliffe’s shot evaded Sam Johnstone’s weak attempted save. Albion’s Jay Rodriguez fired a penalty wide in the second half and seven minutes later Ahmed Heghazi, who was later sent off, deflected Ben Thompson’s cross into his own goal. Bristol City remain in the play-off places, despite Anthony Pilkington’s stoppage-time equaliser for Wigan in a 2-2 draw at Ashton Gate. Aston Villa scored twice in stoppage time to make it six wins in a row and move up to fifth with a 3-1 win at Sheffield Wednesday. Wednesday, unbeaten in 11 games since Steve Bruce took charge, were ahead after just seven minutes as Gary Hooper converted George Boyd’s cross before John McGinn’s fourth goal in his last four games levelled the scores.